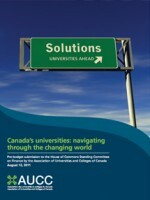 In April 2012, the Association of Universities and Colleges of Canada (AUCC) is leading a delegation of university presidents to Brazil “to encourage greater student mobility and international research collaboration between our two countries” (4). In their Pre-budget submission to the House of Commons Standing Committee on Finance, on August 11, 2011, the AUCC recommends that the government of Canada provide further support for students and faculty to participate in international collaborative research programs. ABECAN has been active over the past twenty years in promoting closer relations between Canada and Brazil. What will be the challenges and opportunities facing knowledge exchange between our two countries over the next twenty years? This paper will provide an analysis of the global contexts in which we work, indicate some of the challenges we face, and, to provide a concrete example of one collaborative project developing a transnational learning culture, I will introduce the work we have begun in a new SSHRC partnership development grant, “Brazil/Canada Knowledge Exchange: developing transnational literacies.” If the role of education under imperialism was largely to divide the world (Willinsky), then the role of education under globalization could be to bring the world together again within different categories of understanding and their related configurations of power. Globally, we are in the midst of a debate about how best to reconfigure knowledge production and its relation to power. Everyone is asking again what education is for. If education once seemed a relatively stable societal institution, that stability is now in question. Education has never seemed more important for prosperity. But what it means, who can best provide it, and under what circumstances, have each become questions for which the answers remain open. Canadians and Brazilians are active participants in these debates and we can all benefit by learning from each other as we engage these questions. The chosen theme – 20 Years of Brazil-Canada Interface – shall attempt to discuss the modern inquietudes, cultural diversities, the challenges of science and the ways for a full social, economical and cultural development among peoples. It is our main goal to discuss the Brazilian and Canadian roles in this process of producing better knowledge for a better world. These are demands that seek to find answers in regional, national and global spaces where the exchanges of experiences and concrete actions of individuals and groups shall be heard and that a new place may be designed in the public environment.